The MCB (Mauritius Commercial Bank) ATM is located near the small commercial centre on Royal Road as you enter Flic en Flac. Both allow for cash withdrawals of up to Rs 40,000 per day (approximately EUR 1000). More info is available in this post. As of 2012, a new Barclays ATM has opened right opposite of the SPAR Pasadena supermarket. 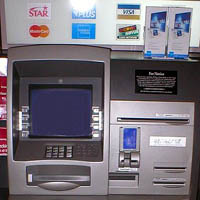 The ATM is capable of dispensing up to Rs 40,000 per withdrawal. Additional MCB and HSBC ATMs are now also available at the Cascavelle Shopping Village at the entrance of Flic en Flac.